Home > Awareness Bracelets > Silicone Rubber Bracelets > Message Bands: I tried being good, but I got bored. This fun Message Band is a thin new band that easy to wear and fun to read. 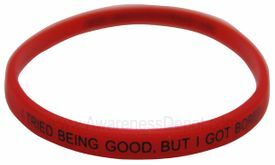 This red message band reads: I tried being good but I got bored. It looks like a rubber band, but is made from 100% silicone. The print is in black. Makes a great gift. Makes a great conversation starter.